Dar Meziana - Luxury Riad in Morocco. 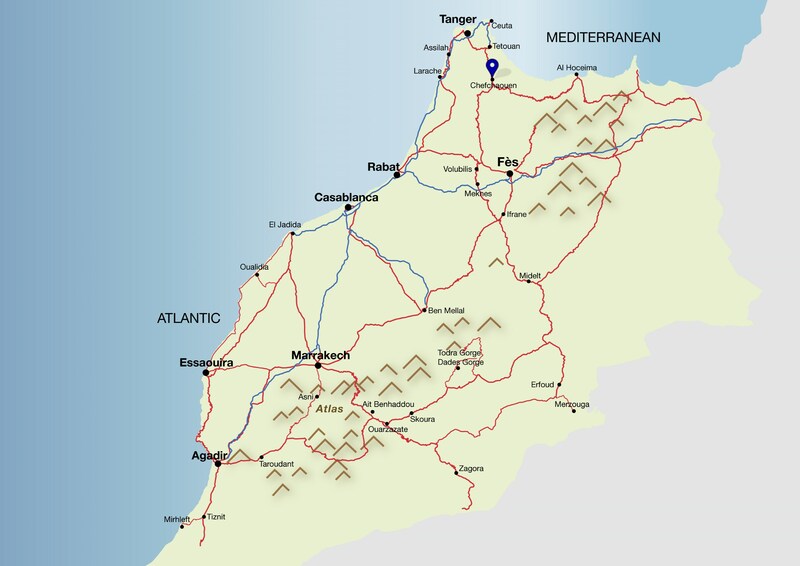 Book Dar Meziana Today with Hip Morocco - Holiday Accommodation in Tangier, Assilah & Chefchaouen, Morocco. "Homely luxury boutique Moroccan experience"
Chefchaouen: Dar Meziana is a very tasteful and well presented collection of traditional Moroccan with a contemporary bohemian flair resulting in a quirky house of culture, discovery and deep mountain relaxation. From leaving the main derb for 1 minute walking up a small street lined with plant pots and walls painted in a deep Chefchouen blue , the entrance to Dar Meziana houses a, quite unique in Morocco, front porch benches and table creating a beautiful tranquil atmosphere perfect for an evening aperitif on you stay in Chefchouen. Stained glass windows at Dar Meziana create a colourful mixture tones complimented by the subtle traditional Moroccan colours throughout. The large central courtyard has intimate dining areas well presented along with subtle and contemporary Moroccan artwork. Grape vines line the black metal trellis offering shade from the hot welcoming sun. The large roof terrace at Dar Meziana has intimate and more collective seating areas for 2 - 8 people all made from local materials. Bright plants populate the terrace creating a harmonious zen like stay in Chefchouen. A beautiful romantic destination Morocco and a road not to miss. The in-riad Hammam is located on the 3rd floor and offers guest a traditional Moroccan experience. When dark green and cream tiling alongside traditional wooden Hammam buckets, this is a very personal and romantic experience in morocco for all. "This hotel is lovely overlooking the town. We had a gorgeous room at the top with a spectacular view and a little balcony. The bathroom was dear, also with a lovely view looking out. We had wonderful food a their separate restaurant, and the terrace breakfasts at the hotel were delicious. The staff were friendly and fun to talk to. You can't go wrong staying here." "Dar Meziana is located at the top of the medina, a 3 minute walk up the hill from Bab Souk. May be a bit of a climb for some. The upper floor suite has great views of the medina below, especially nice in the late afternoon and when the sun first hits the medina in the morning. The dar has a distinctively Spanish influence with colorfully painted doors and windows. It could be a little kitschy for some, but with the warm sun shining though the large windows, it’s perfect. The pleasant terrace is decorated with potted plants and comfortable furniture." "This small guesthouse, with its lovely decor and helpful staff, made us feel right at home in the medina of Chefchaouen. If you arrive by taxi, ask the driver to take you to the Bab Souk arch, where you'll undoubtedly be spotted by small boys eager to lead you to Dar Meziana in exchange for a few dirhams. You'll be glad for help with your luggage, especially when you get to the steep narrow alley leading up to the hotel. When we arrived, Mourad welcomed us with a warm smile and mint tea. Throughout our five-day stay, we found Mourad to be especially friendly, helpful, and happy to practice his English (he also speaks Spanish in addition to his native Arabic)." Situated in the Heart of Chefchouen's blue medina, Dar Meziana is a 5 minute walk from the main square, Kasbah and best restaurants in Chefchouen. The ground floor Lalla Safia room at Dar Meziana is a spacious double room in a simple contemporary bohemian style. The double bed has a deep red mosquito net creating an enticing sensual atmosphere alongside large bedside fabric lined wall mirror. A Moroccan bonquette sits alongside the bed with a Moroccan brass table and hand painted yellow and blue wardrobe doors. 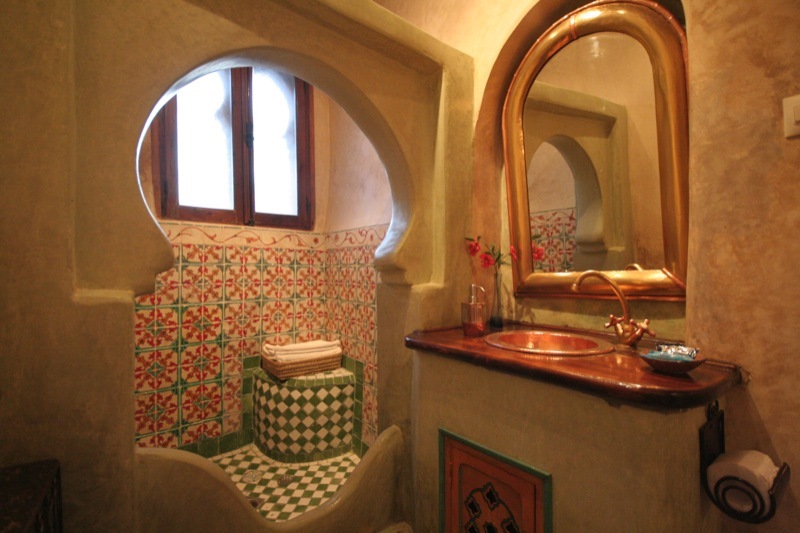 The bathroom at this Riad in Chefchouen had a large shower enclosed by hand crafted green tadelakt. The bathroom window looks down the small blue painted street and medina rooftops. A perfect choice for a couple not wanting too many stairs or those wanting a more authentic Moroccan stay in Morocco. Situated on the 1st floor balcony of Dar Meziana, Lalla Rahma is a cosy double with a homely atmosphere. This room in Dar Meziana has a double bed and small bonquette for 2 people situated below an ornate Moroccan light cover. The windows open onto the central patio as is tradition in Moroccan homes, allowing plenty of natural light in. The Moroccan stained glass bathroom opens to a spacious bathroom with large shower and copper bowl wash basin. A room well suited for a deeply relaxing stay in Chefchouen, Lalla Rahma at Dar Meziana is a good choice. Lalla Alia at Dar Meziana is a cosy double room with a stand out regal style bed enclosed by a sculpted arched entrance and closed off by soft drapes for a mystical and sensual stay in Chefchouen. The bed is raised and accessed by a tall step. There is a small sofa with Moroccan brass table alongside collection of North African paintings and yellow Moroccan window shutters. The bathroom of Lalla Alia at Dar Meziana is crafted with yellow cream tadelakt and rustic tiling in deep rich green colours. There is a deep copper wash basin and spacious shower for 2. A room more suited for a slightly younger couple but one offering a mystical romance and serene charm well suited for a honeymoon in Morocco or intimate discovery of this beautiful town. With a raised bed, enclosed by soft Moroccan drapes in the style of an Arabic harem, Lalla Rahma at Dar Meziana offers guests a mystical and intimate stay in Morocco. A well proportioned room in Dar Meziana, Lalla Rahma has a deep sofa bed, which is used for a step up onto the raised bed, and is perfect for relaxing evening reclining while enjoying a evening aperatif. The cosy bathroom has a rustic yellow and white tiles shower and a ornate hand crafted wall mirror. A good choice for a slightly younger couple, this magical room in Dar Meziana is a perfect choice romantic holiday in Morocco. Located on the 1st floor of Dar Meziana Lalla Ines is accessed through a thick traditional Moroccan door ornately painted by hand in an array of the colours of Chefchouen. A spacious Lalla Ines room has a salon bonquette suitable for an extra person upon request. The double beds sits infront of an antique wooden headboard with small library and a very fresh feel for your relaxing stay in Chefchouen. The large windows look internally onto the patio looking up to the sky open. The ensuite bathroom has a large shower with hand held head. The view from the window looks over flowering plants, rooftops and towering Chefchouen mountains. With a collection of Moroccan culture art and arched doorways, this Riad in Morocco makes for the perfect romantic getaway in the mountains. Lalla Fatima at Dar Meziana is located on the main 2nd floor roof terrace offering plenty of light into this spacious double room. A large double bed is encased by a ornately sculpted wooden frame looking out onto the roof terrace and Chefhouen mountains beyond. Lalla Fatima at this Riad in Chefchouen has a traditional Moroccan bonquette bench in a velvety purple pink colour. Moroccan paintings and furnishings surround Lala Fatima creating a more authentic local atmosphere and one perfectly accompanying a honeymoon in Morocco or romantic holiday in Chefchouen. The bathroom has been hand crafted out of green and cream tadelakt with a dark yellow showerhead creating a deep sensual romantic atmosphere for your stay in Chefchouen. Situated at the top of Dar Meziana on the 3rd floor, Sidi Youssef offers one of the best views in Chefchouen looking down over the medina's blue and white rooftops and Chefchouen’s mountain peaks in the distance. This spacious room in Dar Meziana has a large double bed on a thick Moroccan wood frame and ornate fabric headboard. The deep blue tiles flooring gives this room at Dar Meziana a fresh relaxing ambiance in keeping with the blue heart of Chefchouen. The large bedroom window opens onto a small ledge, perfect for a romantic evening in Chefchouen with the towns light twinkling below. There is a large sofa which can accommodate an extra person upon request. A simply breath-taking view of Chefchouen from the bathroom of Sidi Youssef, this makes for a truest unforgettable stay in Chefchouen. This cosy bathroom at Dar Meziana has a spacious hand held shower cubicle and has been created with orange yellow tadelakt walls creating a homely rural luxury style perfect for a honeymoon in Morocco or intimate sensual romantic stay in Chefchouen. The base rate price at Dar Meziana is in pounds, euros, or Moroccan dirhams and exchange rates are approximate.